HVAC engineers are frequently confronted with the problem of deciding whether the sound propagating in a duct will break out with high enough amplitude into a room to cause annoyance , or with the complementary problem of deciding whether a duct which runs through a noisy room, such as a mechanical equipment room "picks up" enough noise to cause problems at distant locations along the path of the duct run. 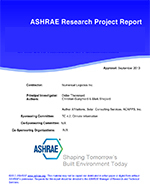 Present ASHRAE guidelines are entirely qualitative and serve only to alert the designer of potential problems without providing information for making quantitative predictions. - How to define, measure, and predict the sound transmission loss in both the breakout and break-in directions? - How to predict the noise that results from the sound radiation of a duct at a specific location in a room? - How to predict the sound power a duct picks up while traversing through a noisy room?